The death of gas volatility in Europe? The level of realised spot price volatility at European gas hubs has fallen to historical lows over the last three years. This fall has been mirrored by a decline in price volatility across the forward curve horizon. Volatility is a key price signal to investors in flexible gas infrastructure, so subdued volatility has resulted in a material decline in transaction and development activity for flexible gas assets. In our view there is a growing complacency in the market as to the value of gas supply chain flexibility. Energy markets are strongly cyclical in nature and there are a set of structural changes driving an increase in gas flexibility requirement. Gas volatility may currently be subdued, but it is far from dead. The level of realised spot price volatility at European gas hubs has fallen to historical lows over the last three years. This fall has been mirrored by a decline in price volatility across the forward curve horizon. The fall in volatility has been driven by a combination of factors: a gas supply glut, weak European demand, relatively mild weather and a lack of supply interruptions. Some of these factors were also responsible for a substantial decline in hub prices after the onset of the financial crisis in 2008/09. Since then gas hub prices have staged a broad based recovery, supported by strength in crude and Asian LNG prices. But volatility has remained stubbornly subdued against a backdrop of a relatively benign market environment with ample supply chain flexibility. Volatility is a key price signal to investors in flexible gas infrastructure. So subdued volatility has resulted in a material decline in transaction and development activity for flexible gas assets (e.g. storage, interconnectors and LNG regas facilities). The fall in realised volatility has been accompanied by a decline in the level of volatility implied from the market pricing of flexible assets (e.g. swing & storage). The liquidity of structured deals in the gas origination market has plummeted in sympathy, although credit issues have contributed to this. Forward market expectations for volatility lack the transparency of forward prices. We have previously provided some insight into implied volatility but the European gas options market is still relatively immature. But we have come across strong anecdotal evidence that the market consensus for forward expectations of gas volatility is increasingly being influenced by the current prolonged period of low historical volatility. In our view there is a growing complacency in the market as to the value of gas supply chain flexibility. Energy markets are strongly cyclical in nature and there are a set of structural changes driving an increase in gas flexibility requirement. Gas volatility may currently be subdued, but it is far from dead. In order to understand the evolution of European gas volatility we focus on data from Europe’s most liquid hub, the UK NBP. The very high correlation between NBP and other North West European hubs (e.g. TTF) means that that the trends and conclusions we draw are relevant to Continental hubs. Chart 1 shows the evolution of the historical NBP System Average Price (SAP) and associated price volatility (calculated based on log price returns across each month). SAP represents the 24:7 within-day market clearing price and is very highly correlated to the NBP day-ahead contract. Prices base: 2002 marked the trough of a substantial NBP sell-off (with Brent crude below $15/bbl). Gas price volatility dipped temporarily in sympathy but rapidly recovered. The decline in domestic upstream flexibility was a key structural factor supporting volatility. High volatility: 2005-06 saw volatility increase sharply. This was driven by a tight gas market with cold winters, supply interruptions (Russia/Ukraine in Jan 06) and infrastructure issues (e.g. Rough storage fire in Jan 2006). Volatility decline: Volatility declined rapidly after new supply infrastructure came online in the UK (e.g. Langeled pipeline & Ormen Lange field from Norway) easing market tightness during a period of milder weather. Price boom: The 2007-08 commodities boom saw a rapid increase in gas prices but this was not accompanied by a material pick up in spot volatility, as the global gas supply glut set in and Europe was oversupplied. Crisis & new supply: Commissioning of new LNG regas infrastructure (e.g. South Hook and Dragon in 2009) and robust LNG imports contributed to a consistent trend lower in volatility despite a recovery in gas prices after the 2008-09 financial crisis. Price recovery, volatility subdued : The Fukushima disaster resulted in a disconnect between Atlantic Basin and Asian LNG prices with European cargo diversion reducing UK imports, but with spot volatility remaining subdued. Despite the current historically low levels of spot gas volatility there is a strong structural shift driving an increase in requirement for short term gas flexibility across Europe. Flexible operation of gas plant is set to play a key role in managing the increase in intermittent wind and solar generation output. Gas flexibility requirement from the power sector is also being driven by relative gas vs coal pricing. The relative strength of gas prices means that gas plants are increasingly being pushed into provision of peaking services rather than running at high load factor. The increase in flexibility requirement from the power sector is set against a backdrop of a decline in upstream production flexibility in North West Europe as import dependence increases. Production flexibility may be replaced by new storage and LNG re-gas infrastructure. However ongoing capital constraints and a lack of a clear market price signal are hampering investment. 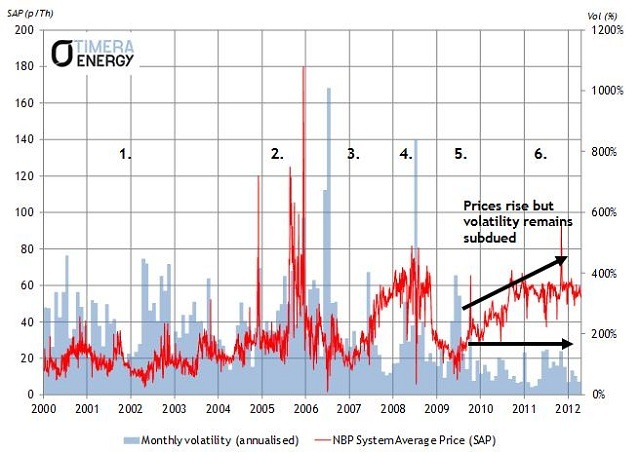 History shows that European gas volatility and prices are strongly cyclical in nature. A key contributor to this cyclicality has been changing investor awareness and risk appetite as prices respond to market events. So it is possible that there will be a rapid transition to a period of greater structural tightness in gas flexibility, precipitated by a supply/demand shock. This could for example be a severe winter, further Russian supply interruption, a major asset outage or Europe having to compete over a prolonged period with Asia for LNG. The advantage of current market conditions is that investors and energy portfolio’s can acquire flexible assets (e.g. storage, swing, interconnector capacity) relatively cheaply. Some renewed buying interest has emerged in North West Europe in the last few months focused on this value proposition. Timing a transition to higher volatility is of course a difficult challenge. But history shows that waiting for the market to deliver a clear price signal before investing in gas flexibility can be an expensive mistake.